ABOVE: Heavy suitcases may seem manageable at the railroad station or airport, but they're a nuisance when you're going to or from your hotel. "Travel light" is often presented as a moral choice: the traveler's equivalent of "Don't smoke" or "Scrape those sausages and eggs off your plate and eat a bowl of Müesli." Not being moralists, we prefer to think in terms of convenience. 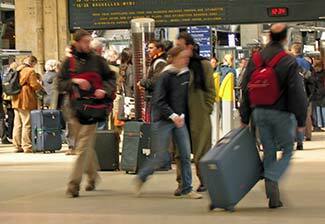 When you're rolling a lightweight suitcase of carry-on size, you'll find it much easier to squeeze onto a crowded train or bus from Charles de Gaulle or Orly Airport, and you'll be grateful for your choice of baggage when you need to climb stairs in the underground station or your hotel. To lighten your load, bring clothes that weigh little and are easy to drip-dry. Blue jeans are heavy and bulky, and they can take days to dry in a hotel bathroom. In contast, lightweight travel trousers, shirts, skirts, and underwear take up little space, are easy to wash, and often will dry overnight. If you insist on hauling a large suitcase, consider one of the new four-wheeled upright bags, which can be turned and rolled sideways for easier maneuvering in train aisles. Less luggage means fewer items to keep track of, and reduced vulnerability to thieves. 1st inset photo copyright © Gary Alvis. 2nd inset photo copyright © Antler. 3rd inset photo copyright © Live Luggage.